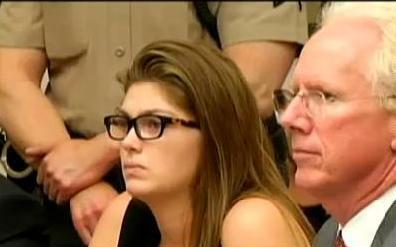 Nikolette Kristina Gallo with her attorney, Paul Pfingst, at her sentencing hearing, July 27, 2012. Screen capture from Ch. 8. Nikolette Kristina Gallo had pleaded guilty in June to the March 11th hit and run incident at OB’s entrance that killed Sho Funai. On Friday, July 27th, she was sentenced by Judge Dwayne Moring to one year in prison, plus the standard five years of probation. The 19-year-old Gallo had admitted that she had drank alcohol and smoked marijuana prior to the crash at the end of I-8. 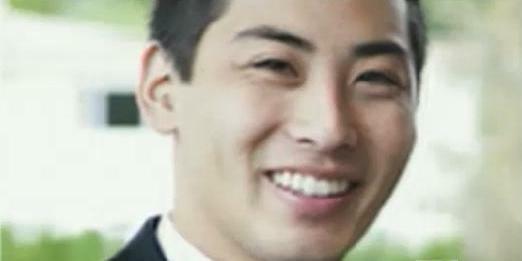 It left Funai, an engineering student at UCSD, without a life. The victim’s family was still not satisfied. “We don’t feel that the sentence matches the seriousness of the crime,” said Daisuke Funai, one of the victim’s older brothers. The prosecution argued for state prison. As it is, Gallo – who had no prior record – will serve her one year in local County custody. Paul Pfingst – the former County DA – represented Gallo. She had reportedly stated that she had just dropped off a friend in the beach and was then on her way home; she thought she had hit a discarded sofa or a coyote. He said that his client “panicked” and drove home after hitting the man. She called her dad two times after the 4:30 a.m. incident but did not call 911. She was arrested after another attorney called police about 5 hours after the crash. “My client had an obligation to stop. She did not fulfill that obligation,” ” Pfingst said. He also added that just moments before the incident, an older couple driving to the airport did call 911 to report a man believed to be Funai in dark clothing walking in the roadway. They could have hit him they said if he had been in their lane. Sho Funai, victim of the hit and run. Funai’s family and friends have described him as a guy who walked home to avoid DUI’s. Funai was a new resident of OB and perhaps had lost where he was going in the dark that night. He did have a blood-alcohol level of .17 percent – 9 points over the legal limit in driving a vehicle. When Gallo was tested there was no evidence of alcohol or pot use. Here are the news sources for this article: CBS8.com, Channel 6. Sure the guy was wasted but he never intended to drive a vehicle that night so I don’t see how this is relevent. And of course there was ‘no evidence’ the driver had been drinking… she was tested hours after the accident. It is relevant because witnesses saw him in the road. So he was wasted and had wandered into the asphalt and contributed to his own death. That does not excuse the hit and run but it means he was not without fault in this tragic incident. She admitted to drinking but by time she was tested, the alcohol had evaporated. @Emma, it is relevant because I’m pretty sure a person with a 0 percent blood alcohol level wouldn’t have been walking where he was at that time in the morning, unless he or she had a death wish. In fact, if a cop saw him walking around that morning, he probably would of gotten arrested for violating California Penal Code 647(f) PC “Drunk in Public”. Too bad he didn’t though because at least he’d still be alive. Well, I hit a cat last year and I took the kitty to the vet. I cost me $150.00 the kitty died. There is something to be said about people that run over someone and think “wow I just killed someone, I better get out of here. Back in the 60’s I got busted in OB for pot and I did a year. Hard to understand if we all take the DMV test, and (hopefully) we all study the same book on road regulations for the PRIVILEGE to operate a vehicle, why is there such a disparity between being responsible like Allen Lewis and checking on what your car made contact with, versus the “No Cop No Foul” and continuing on. You drive away when you KNOW you did something wrong and have no moral compass. What kind of people raised this girl? I feel sad for the family and friends of Sho Funai, but I think Nikolette would not be spending ANY time in jail if she had owned the situation in the moment. Look at the guy who hit and killed the Comic Con fan…not only was he not arrested, he was doing his thing at Comic Con just hours after his vehicle took the life of another human being. So it would appear that a cowardly decision to leave a young man to die alone in the road is what led to Nikolette having to spend time behind bars. I hope that Nikolette will make amends with those hurt by her thoughtless actions, and that when she regains her freedom, she goes to high school and college campuses to warn other young people of the importance of doing the right thing…. I forgot to add, after the kitty was pot to rest I had to go find the owner and tell them I killed there cat. That is purity much the only life I have taken, ( I did run over a few bunny’s a time or two, when they ran in front of my car). So,,, you can kill a person and get a year, and you can get busted for pot and get a year… Don’t get it.. sorry. He did have a blood-alcohol level of .17 percent – 9 points over the legal limit in driving a vehicle. When Gallo was tested there was no evidence of alcohol or pot use. He was obviously unable to care for himself due to his intoxication and placed himself in harms way. Without seeing the collision report, it would appear the collision was the young man’s fault, as sad as it is. The young lady, I believe, received a reasonable sentence based upon all the facts and without any emotional input. It can even be said that the young man put the young ladies life in harms way by his own reckless behavior. Very sad incident for all who are involved. There have been conflicting stories as to whether the victim, Sho, was in the road or on the shoulder. It appears the investigation/court ruled he was in the road, and I sincerely hope they were not mistaken.